The western tarnished plant bug or lygus bug (Lygus hesperus) continues to be a major pest of strawberry on the Central Coast. Most growers typically rely on chemical or biological pesticides to manage pest. Some growers also use tractor-mounted vacuums to remove the pest, but the western tarnished plant bug is a major concern as it causes significant losses to marketable yields by deforming developing berries. Considering the status of the pest, having additional control options is critical both to reduce yield losses and also to strengthen the current integrated pest management (IPM) strategies. A solar-powered UV light trap was reported to be a potential tool for controlling a variety of coleopteran, lepidoptera, hemipteran and other pests including the western tarnished plant bug. 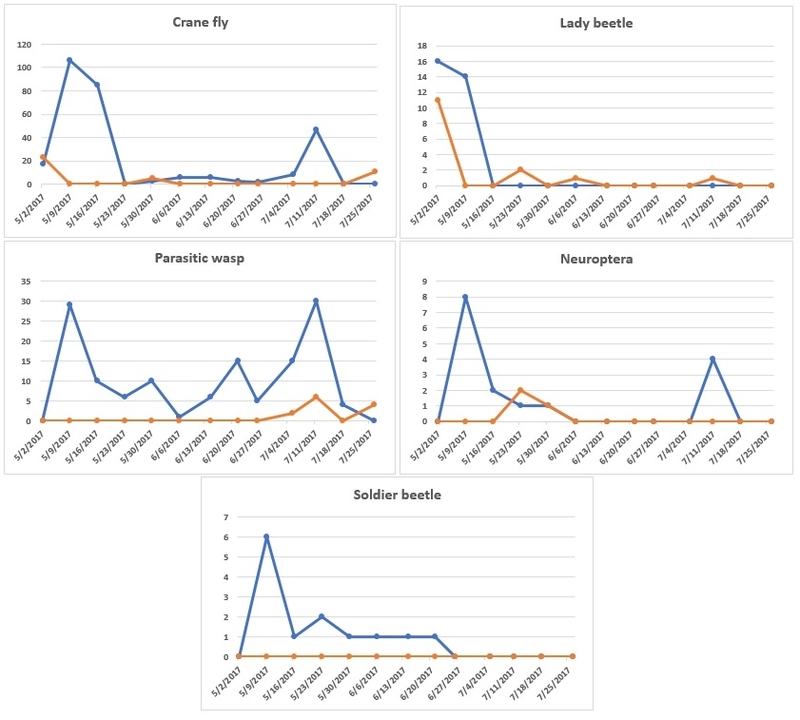 To evaluate its role as a potential IPM tool for strawberry pests a study was in conducted in fall-planted organic and conventional strawberry fields in Santa Maria. Specifications of the trap: UV light trap known as Solar Powered Pest Control Machine (Model GFS-8) is manufactured by GreenFuture Equipment based in Sacramento, CA. It has a 30W solar power panel and a 12V battery to power a dual color UV light bulb and a rotating grill/grid for two nights on one day of charging. The grill surrounds the light produces 3600 volts of electricity with a surface area of 2.37 sqft and electrocutes insects as they are attracted to the light. Each light trap is supposed to cover 3-4 acres of area. A rubber flap brushes off insects into the container in the bottom of the trap as the grill rotates periodically. Experimental set up: One light trap was set up in a conventional strawberry field on West Main St (Manzanita Berry Farms) and another one in an organic field on Solomon Rd (Eraud Farms) in late March, 2017. 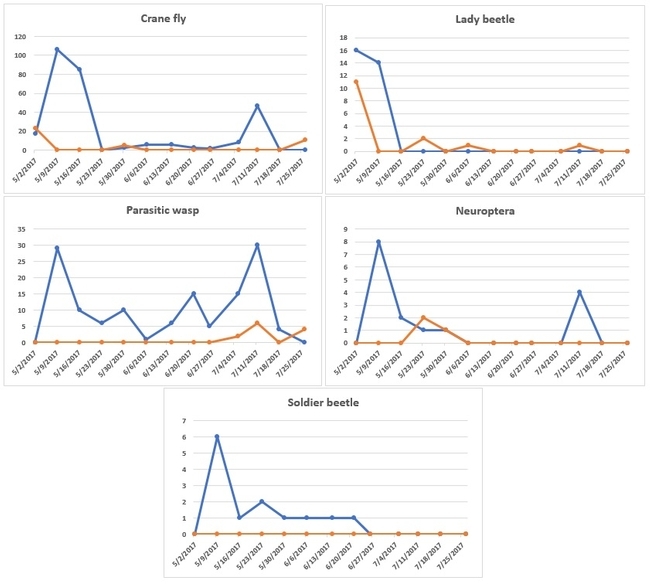 Contents of the container were collected each week in a bag, taken back to the laboratory, and pest and beneficial insects were categorized and enumerated. 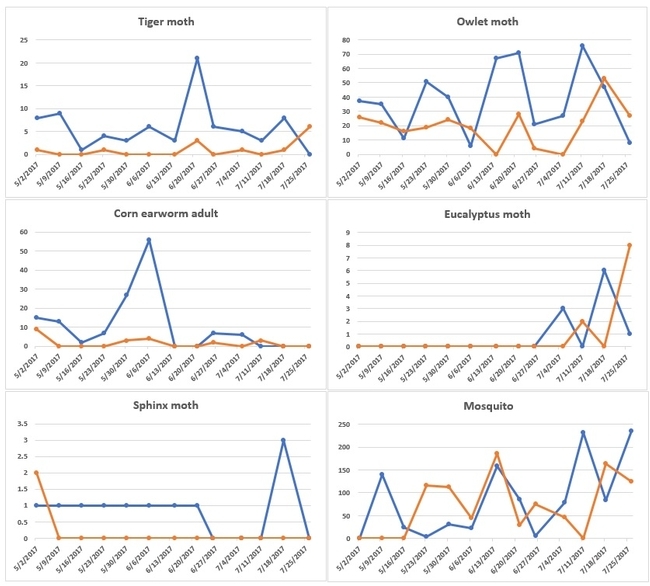 Observations were made on 13 sampling dates between 2 May and 26 July, 2017. Results: There were several groups of beneficial and pest insects were found attracted to the light trap. However, the western tarnished plant bugs were not seen throughout the observation period although field scouting indicated their presence. 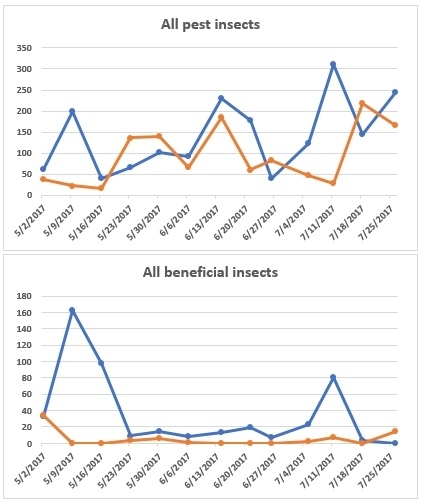 In general, the western tarnished plant bug infestations were lower this year and grower was able to manage pest populations by regular vacuuming. Pesticides were not used to control this pest during this period. Among the pest insects trapped, corn earworm (Helicoverpa zea) adults were the only ones known to be a pest of strawberry in California. Insects that are generally recognized as pests included tiger moths, owlet moths, corn earworm adults, eucalyptus moths, sphinx moths, and mosquitoes while the beneficial insects included crane flies, lady beetles, parasitic wasps, neuropterons (such as lace wings), and soldier beetles. Some crane flies are important in the ecosystem as a prey for some animals and birds or through the activity of the larvae on decaying organic matter in the soil. However, their impact in strawberry is unknown. The number of both pest and beneficial insects was higher in the organic field than in the conventional field. 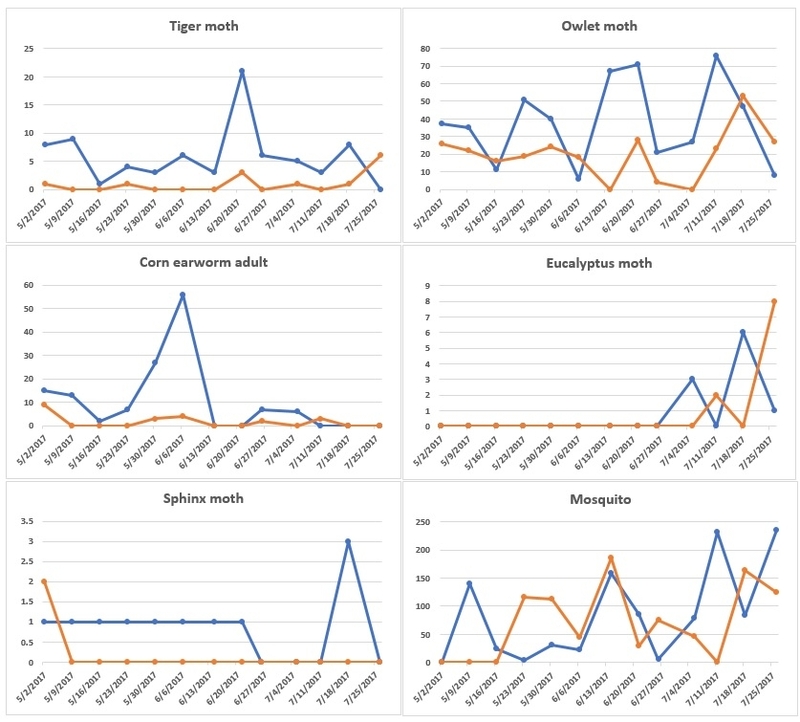 Seasonal average of all insects per sampling date was 177 for the organic field and 98 for the conventional field. The proportion of the beneficial insects was about 27 in the organic field and 5 in the conventional field. Although the role of UV light traps as a control option for the western tarnished plant bug could not be determined, it appeared to be a good tool for trapping corn earworm adults and other moths. This light trap could probably be useful for managing lepidopteran pests in strawberry or other corps. Acknowledgements: Thanks to Dave Peck for his collaboration, GreenFuture Equipment for donating the light traps, and Maria Murrietta, Tamas Zold, and Chris Martinez for their technical assistance.